Kent State University's Metin Eren, Ph.D., director of archaeology and assistant professor in the Department of Anthropology in the College of Arts and Sciences, and his colleagues are not only asking these questions but testing their unique new theories. They want to better understand the engineering, techniques and purposes of Clovis weapon technologies. 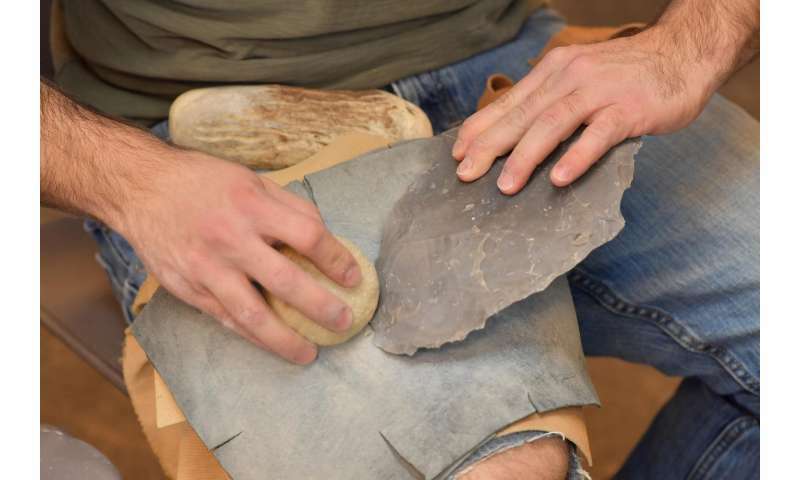 Specifically, they study stone projectile points, such as arrowheads and spear points, made by flint knapping, the ancient practice of chipping away at the edges of rocks to shape them into weapons and tools. In their most recent article published online in the Journal of Archaeological Science, Eren and his co-authors from Southern Methodist University (Brett A. Story, David J. Meltzer and Kaitlyn A. Thomas), University of Tulsa (Briggs Buchanan), Rogers State University (Brian N. Andrews), Texas A&M University and the University of Missouri (Michael J. O'Brien) explain the flint knapping technique of "fluting" the Clovis points, which could be considered the first truly American invention. This singular technological attribute, the flake removal or "flute," is absent from the stone-tool repertoire of Pleistocene Northeast Asia, where the Clovis ancestors came from. Archaeologists have debated for years as to why the Clovis added this flute feature to their points. Basically, it is a thin groove chipped off at the base on both sides, perhaps first made by accident, which logically makes it very thin and brittle. However, after several types of testing, the researchers have reported that this thinning of the base can make it better able to withstand and absorb the shock of colliding with a hard object, such as the bone of a mastodon or bison. This fluted point turned out to be an invention that allowed these colonizers to travel great distances with some confidence that their weaponry would hold up at least long enough until they could find the next rock quarry to make new points. "It was risky and couldn't have been easy to learn how to do this effectively," Eren explained. "Archaeological evidence suggests that up to one out of five points break when you try to chip this fluted base, and it takes at least 30 minutes to produce a finished specimen. So, though it was a time-consuming process and risky technique, successfully fluted Clovis points would have been extremely reliable, especially while traveling great distances into unknown regions on a new continent. They needed points that would hold up and be used over and over again." In their article, the researchers compared standardized computer models of fluted and unfluted points, as well as experimental "real-world" test specimens, and found that the fluted-point base does in fact act as a "shock absorber," increasing point robustness and ability to withstand physical stress via stress redistribution and damage relocation. In other words, upon impact, the brittle base of the spearhead crumples and absorbs some energy, which prevents fatal breaks elsewhere on the point so it could be reused. "It's amazing to think that people 12,000 years ago were flaking shock absorbers and engineering stone weapons in a way that it took 21st century modern engineering to figure out," Eren said. 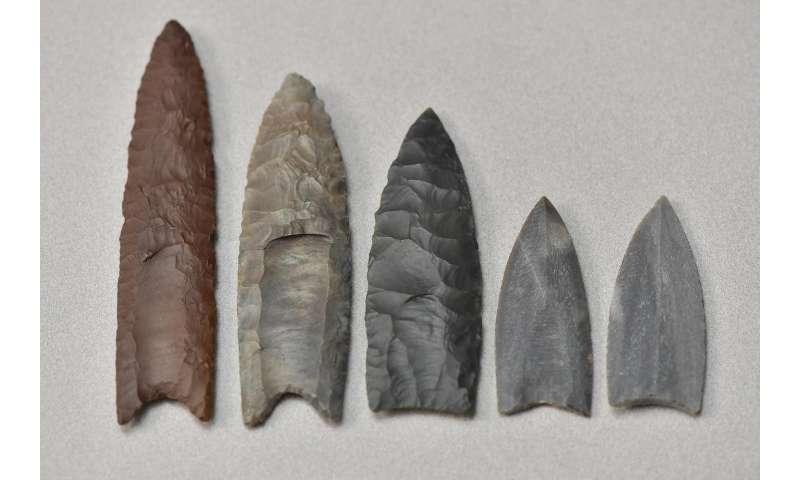 "As engineers, we don't typically get to work with archaeologists, but this project has allowed us the exciting opportunity to provide additional tools from engineering mechanics to explore how fluting affects the behavior of Clovis points," Story said. That theory may be correct, but it is not intuitive to me. What IS intuitive, is that it would improve the aerodynamics of the air flow from the arrowhead to the arrow shaft, allowing it to fly further and retain more energy on impact. I have a trivial invention of very simple technology. (I earn my living from it, it's for a type of tool people have to use which has been widely tested and replicated.) Like the arrow heads it has no moving parts. I now know that it was based on a profoundly simplistic understanding of the phenomena, and furthermore benefited from a coincidence that let the nature of the materials solve certain problems I didn't even realize existed. In the late 20th century we had people around the world making use of a development none of us truly understood. The analysis reported about these weapons is very informative from one perspective but it may not inform us about the way the fluting was discovered and developed. I always assumed that it was done to make it easier to attach the point securely to the shaft. I am happy to learn of additional reasons. True. And it should also have less 'flesh resistance' as it penetrates the animal, and hence might be deadlier even per retained energy. One further consideration may be that some hunters want the arrow/spear to slide easily out so that the wound is not 'plugged' by the arrowhead/spearhead (the quarry would be able to keep running longer because of lower blood loss rate due to the 'plug'). Also, a spear/arrow head with a rear much thicker (than the point and smoothly curved middle section; and the shaft diameter) would be stuck inside the animal for too long and if the animal stumbled/rolled etc it would break the also-valuable shaft. And again, that too would leave the head still inside the wound, acting as a 'plug' slowing blood loss, so a large animal may get up dangerously and run. In subsistence hunter-gathering, too much energy unnecessarily expended 'chasing' wounded game for longer than necessary may cost lives. Not to mention energy/time/resources wasted if valuable arrow/spear head (and shaft) damaged/lost. Not following your reasoning here, @Whyde. Looks linear to me. This has some similarities to placing fullers in dark age and early medieval swords. By varying both the material properties and the temper between the edges and the center of the blade, the blades are less brittle and do not break as easily. There is also a weight reduction component in the sword blades that may not be a factor in stone points. In the stone points, the flutes didn't apparently create flexibility, it sound more like a shock absorbing effect. In flight, the maximum momentum (kinetic potential?) is along the center of the entire projectile length. Since the relative flatness of the head was necessary to reduce "rest mass" (as well as flight drag), something else was needed to make the impact more effective than just a pointy stick. At impact, that same "aero envelope" concept creates a wider turbulence zone than the actual spear or arrow head, in the fluidic environment of flesh. The fluting aids in distributing the kinetic potential to a wider area than just the stone surface area. Previous article made a good argument for the Clovis points being detachable so they would remain in the would while allowing the hunter to jam another fluted point onto his spear shaft. Also, Clovis tech looks like Solutrean tech from ice age France. I feel a little odd correcting a mistake on an archeological page. Clovis people did not use bow and arrow technology, so they had no use for arrows. The "improved robustness" theory seems misnamed. If the spearhead is designed to crumble and break at the base it is hardly more robust. Better to have a stronger point that doesn't break, like the next 10,000 years of tool making provided. And a crumbling base is not an example of shock absorbing. Shock absorbing prevents damage, it doesn't encourage damage. There are better theories for fluting. I prefer the theory that the point was thinner in the area that the shaft attaches, allowing greater penetration in the large animals being hunted by clovis people. No Eric, Clovis tech does not look like Solutrean tech. You have been reading too may fiction books by Dennis Stanford.